Below you will find all the information you need to prepare for THE FINAL PART of the Family Advent Experience. The structure is short and simple, but we also have provided some extra ideas so you can tailor it to your family and setting. You can use this week to connect with your family tribe and learn about one of the most dramatic moments in the Christmas story. Setting Up: Before you gather your family for the Final Advent Experience of the season, take a little time to prepare. Have your advent wreath, candles and a lighter or matches ready. Some instrumental Christmas music in the background always helps. You may want to dim the house lights just a bit. If you are going to have a meal together before or after the Advent experience, get ready for this to not take too much time so you can focus on advent. Lighting the Fifth Candle on the Advent Wreath: Someone in the family should light the First Second, Third, Fourth and Fifth (middle) Advent Candles. Let the kids take turns doing this, if it helps get everyone involved. The fifth candle you light tonight (or today) will be the white candle in the middle of the wreath. This represents the coming of Jesus when he was born in Bethlehem. Reading the Bible Story: Read Isaiah 9:2-7 – the story told long before Jesus came by the prophet Isaiah predicting many of the incredible ways that the Son of God, Jesus, would come into the world. In this experience, we focus on CELEBRATING JESUS into our hearts and homes, just as Mary and Joseph, the Wise Men and the Shepherds celebrated him coming into theirs so many years ago. You may want to use BibleGateway.com or Youversion.com to find the Biblical passage. If your children are old enough (pre-teen or teen years) you may want to read the passage, have one of them read it or listen to an audio version on YouVersion.com. If they are younger, we suggest you “tell” the story using the next, Make It Plain, section. 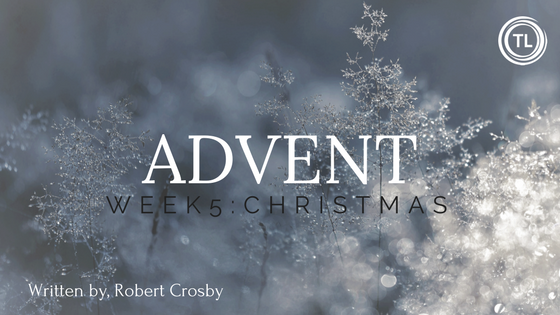 Acting Out the Bible Story – Making it PLAIN: Since today is Christmas, instead of acting out a new story, take some time to remember the four Advent experiences you have already had together. Remember some of the highlights and your experiences on each of these: Week One – CELEBRATING HOPE: Searching for Jesus, the Story of the Wise Men; Week Two – CELEBRATING LOVE: Waiting on Jesus, the Story of Mary and Joseph; Week Three – CELEBRATING JOY, Announcing Jesus; and Week Four – CELEBRATING PEACE: Welcoming Jesus, the Story of Bethlehem. One great way to remember these nights is to pull out some of the images you took on those nights of your family in action and worship. Also, you could sing one of the songs from each of those nights. And, remind them of the different foods they ate and the parts they acted out in your family drama sketches. An Activity for Younger Children – At the start or end of your Family Advent Experience, play a game of “searching for THE BABY JESUS”. Before the night starts and while the kids are out of the room, hide the THE BABY JESUS statuette from your nativity scene somewhere in the house. At the right time let them search for them with you notifying them of their “hot” or “cold” proximities. This is a great way to liven the night up and burn off some excess energy. An Activity for Pre-Teens & Teens – Ask Up! – Take time to ask them Questions that relate to the theme of PEACE. Let the discussions flow as best they can, allowing your kids to open up as much as they will and for you to hear each other well: What is something someone has done to make you feel really WELCOMED? What is something someone has done that made you feel UNWELCOMED? What are some ways we can WELCOME Jesus into our lives, our home and our everyday? Thank you for the story of the birth of Jesus and all it means to each of us and to our family. Thank you for the way the Wise men SEARCHED SO HARD FOR JESUS. Thank you for the way Mary and Joseph WAITED SO PATIENTLY FOR JESUS. Thank you for all JOY AND HOPE the Angels brought to the Shepherds ANNOUNCING JESUS. Thank you for THE PEACE we can have when we open our hearts and homes to Jesus, Your Son. We welcome you in our lives right here today. Happy Birthday, Jesus.